A length of rope coiled twice around the performer's neck passes visibly through. Second time the rope penetrates the neck the knot is formed in the middle. It's crazy! The performer ties another knot above the first one, then another, and another, until a large bundle of knots is formed.. Unexpectedly, the big knot detaches from the center of the rope and falls off. 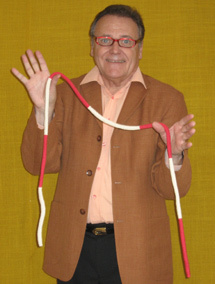 The performer is left with just a short piece of rope between hands. The performer picks up the bundle and places it onto the short piece. By pulling, he makes the knots slowly dissolve into nothingness until the rope is stretched in its full length.as at the commencement.